Grading quizzes is one of those tedious and time-consuming aspects of teaching. Since I no longer collect and grade homework, I quiz often — which can lead to a lot of grading. Research indicates that students learn best when feedback is provided in a timely manner, and also that they don’t learn much from feedback that is provided weeks after the completion of a long-since-forgotten unit1. In my classes, I allow my students to retake quizzes, which means that they need to know how well they did so they can prepare for the quiz retake. As a result, I need a quick turn-around time on providing student feedback on quizzes. For all these reasons, I allow my students to grade their own quizzes. At the front of the room, I create three grading stations, a solution that works for me based on the size of my classroom and number of students. You could always use more or less stations, based on your space and number of students. At each station, there is a copy of the answer key with two colored pencils. Because I always grade in green pen, this system allows students to easily tell the difference between my comments and theirs. During our first quiz, I instruct the students that they may come up to one of the grading stations to grade their quiz. Students are not required to grade their own quizzes, but typically they all do. If students decide not to grade their own quiz, then I grade it myself. There are only two rules. First, there cannot be more than two students at any one station at any given time. Second, students must use my colored pencils to correct their quizzes, and are not allowed to have any other pencil or pen with them at the grading stations. If I catch students using any other writing tool other than my colored pencils, they receive a zero on the quiz and cannot retake that particular quiz. For a second offense, the student will lose the privilege of self-grading and can no longer retake any quiz. I am very diligent about watching students in the beginning, because I get a few innocent accidents that I let slide. Once students are familiar with the system, however, things run very smoothly. One way to mitigate cheating is to keep the answer keys face-down at each station. After the students grade their quizzes, they turn them in and I enter them into the gradebook. I always review the quizzes before entering them, because I want to check their work and get an idea of how well each student is doing in the class. I also add my own comments at this time, and return the quizzes to the students the next day. I have been using this system for five years, and have only had one student lose their retake privilege. Students love this system! I have had overwhelmingly positive feedback from students. They love immediately knowing how well they did on a quiz. There’s no anxiety or stress wondering about how well they did. It also builds trust. Students feel respected, knowing that I trust them to see the sacred answer key and grade their quizzes truthfully. It’s a small thing, but it’s something. As they grade their quizzes, I encourage my students to write comments to themselves to help them study in the future. I could make this a requirement, but don’t think that is the best method. Most of my students eventually see the benefit of writing and reviewing the comments. They will write things like “I divided by the molar mass when I needed to multiply,” “I forgot to use the molar ratio,” or the ever-popular “UNITS! !” This process causes the students to reflect on their mistakes rather than just looking at the numerical grade and forgetting about the quiz, or putting it in the trash. Feedback is important for students’ growth, and I think it’s even more effective if it comes from the students themselves. That being said, I still include some of my own comments — just not as many. This approach to grading also encourages instant discussions about the material we are working on. In the past, it would take a couple of days to go through a set of quizzes, which I would then hand back while we were in the middle of the next topic. Now we can discuss the quiz immediately. When everyone is finished with the quiz, I answer questions or even go over the quiz with the students. Students grade themselves harder than I do. In the beginning of the school year, students grade their quizzes with an all-or-nothing mindset. For example, if they get the mass incorrect, they take off all the points. As we progress through the year, they start to better understand the concept of awarding partial points. They realize that there is more to correctness of a question than just the answer. As a result of self-grading, students see more of the details and understand the value of showing their steps as they solve a problem. I often get questions about why I did a particular step on my answer key. Right about now, you may be saying, “Wow, this sounds too good to be true.” Well, it is…kind of. The fact is I still grade the quizzes — but in half the time. The students’ corrections make it easier for me to grade, because they point out all the mistakes. Actually, once they learn how to assign partial points, their calculation of their grade is almost always the same as mine. Rarely do I find a student who misses a correction. I could probably get by without grading them myself, but I almost always do. I think it is important to reinforce the students’ comments with my own, and let the students know I’m not having them do my job. I suppose that on occasion, when time is an issue, you could use the students’ grades if you are confident in their ability. I have also found that I make fewer mistakes when grading, since I now have a second pair of eyes grading each quiz. You may also be saying to yourself, “OK, I like this idea, but if I share my answer key with first period, then the later periods will know the answers.” To solve this, you need to have multiple copies of your quizzes for each period of the day. I know this seems like a lot of extra work, but it doesn’t have to be. You could easily break up the work with your colleagues. 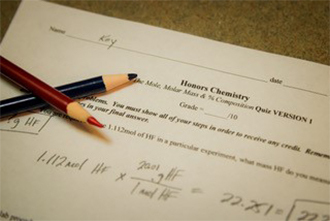 For most topics, it is easy to create multiple copies of chemistry quizzes. Instead of having students find mass, for example, have them solve for moles. Or, instead of solving for the volume of a gas, make the second version ask them to calculate its pressure. I have been making multiple versions of my quizzes for years. These alternate quizzes can also be used for retakes. I usually teach no more than three sections of the same course. At this point, I have about five to six versions of every quiz. In the beginning, when I needed a retake quiz, I would recycle the other periods’ quizzes. Even if the students knew I was doing this, they wouldn’t know which period’s quiz they would get. Overall, the pros most definitely outweigh the cons. The benefits to the students alone make this process worth it. Do you have a system for grading quizzes that works for you? I’d like to hear your thoughts. Consider sharing your ideas on the AACT Discussion Board. Goodwin, B.; Miller, K. Research Says / Good Feedback Is Targeted, Specific, Timely. Educational Leadership. 2012, 70(1), 82–83. Dan Dulek is an Honors and AP Chemistry teacher at Amos Alonzo Stagg High School in Palos Hills, Illinois.